In March 1995, ‘Back Track’ had an interesting article on the gauge of railways, with particular reference to the GWR broad gauge and the 4′ 8.5″ ‘narrow’ gauge. Railway history is often thought of as a battle between these gauges, between Brunel’s masterpiece and the width of a Roman horse’s rear and its attached chariot. In the totality of the applications of railways to transport both in the UK and the rest of the world, the variations in railway gauge are remarkable. In 1983 the Industrial Railway Society published a list of National Coal Board underground flameproof locomotives that had operated since nationalisation on 1st January 1948. In that short period of approximately 35 years, such locomotives had been supplied by outside industry to 30 different gauges, at every inch increment between 1′ 6″ and 3′ plus 3′ 6″ and many 1/2″ increments….. The author goes on to examine how units of measure dictated gauge. I was unaware of units such as the Castillian foot (6′ = 1672mm) and Swedish feet (4′ = 1188mm). Britain could have used metric gauges, but it was anathema to the British government because of its revolutionary (and French) origins. And to support the fact that there was no ‘standard’ gauge in the early years of the railways, here is a list of some gauges used – although the total mileage shown here is probably only a few hundred miles. This list puts some perspective on us modeller’s arguments over HO, OO, EM and P4. The above list has them all…..
Technically, the broad gauge was superior to the standard gauge adopted in 1846. And Brunel would have probably won the battle if he had expanded the network northwards, rather than consolidating the railways in the south-west. … in the United States it was a case of anything goes for many years in spite of the fact that the Stephenson gauge had been introduced very early on. Most of the railways in the south-eastern states were built to the 5′ or Carolina gauge, resulting in major problems in the Civil War. The Erie Railroad was built to a gauge of 6′ and possessed some splendid locomotives built to take full advantage of it. [See here] Over 3,000 miles were built to 4′ 10″ and there was a compromise of 4′ 9.25″ in some places to allow both 4′ 10″ and 4′ 8.5″ to use the same tracks. Wider wheels were used, but derailments were common. When the Niagara Bridge was opened in 1855, it could accommodate trains of three gauges: 6′, 5′ 6″ (running in from Canada) and 4′ 8.5″. France for example used 1.45m (The Est, PLM and Midi), 1.44m (the Nord, PO and Etat) as well as some 1.435m. Rationalisation to the latter has been relatively recent. The most bizarre railway project of this century was Hitler’s Breitspurbahn, a broad gauge railway of colossal proportions. The gauge was to be 3 metres and that would achieve speeds of 250km/hr. 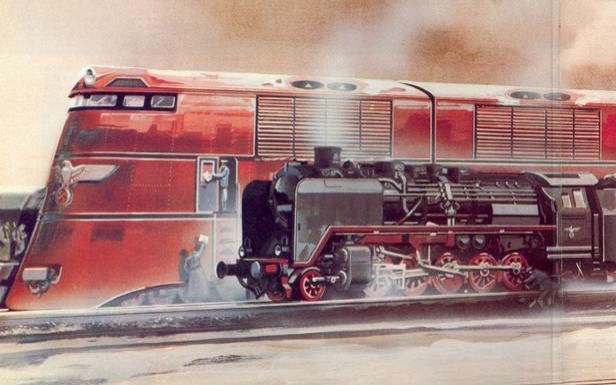 Monstrous locomotives of 30,000hp were planned, weighing over 1,000 tons each. That would be some model! 2mm scale on S4 track would be about right???? This entry was posted in Out and about, Prototype, Weird and wonderful and tagged inspiration, prototype, railway. Bookmark the permalink.